Our Steampunk and Gothic Rings and Earrings come in every design from poison rings, standard rings, and two-finger rings, single earrings, and pairs. The Betrothal Ring features a miniature, rococo masterpiece of romantic tokenism, with the blood red enamelled heart of passion. Our gothic rings are hand cast and made in England from fine English pewter. A bleeding heart often becomes a broken one. Thus, the bleeding heart and the black rose, symbolic of dark or doomed love, go well together. And never before have they been as perfectly paired as they are in this Bed of Blood Roses Ear Wrap. An elemental symbol of everlasting love and combining the all-pervasive heart with the ancient Egyptian Ankh is a symbol of everlasting life. A pair of delicate, pewter scroll work ankh-heart earrings, with 6mm crystal. The Cesare's Veto Earring is the 16th century Cesare Borgias Florentine solution to all political problems. The bloody dagger makes for an impressive and intimidating accessory, one that you can now feature in your everyday look. Rare can easily mean appealing or valuable. These Black Rose Stud Earrings are easily the former, and hardly the later, making them easily be afforded so that you can sport the rarity and beauty of the black rose when you wish. A symbol of faithfulness and constant affection beyond the grave, the rose is an elegant, but distinctly gothic display of sentiment for those with a Mediaeval sense of romance. Diamonds are not just a girls best friend. They can also be a goths best friend too! This Diamond Pall Earring offers crystalline elegance to any goth lady in a double earring design that features both a cuff and a stud. A short drop and a sudden stop has been the end of many lives over the centuries. The Hang Man's Noose Earring fuses the executioners knot with the skull, creating a potent symbol of mortality to add to your ensemble. Masterfully crafted and beautifully set with crystal, the Dark Desires Earrings are the very symbol of ill-fated love, a black rose accented by fallen, dark teardrop. These earrings bring dark beauty to any look they are added to. The Demi Alchemist ring features a classic portrayal of the Alchemist, with black rose in its mouth. This Gothic ring is hand cast from fine English pewter and in many cases, including high quality materials and finishes. The Deus Et Natura ring represents triumphant harmony of Nature and the Creator. The gothic ring has a solid metal Latin band, reading, Deus Et Natura No Faciunt Frusta, or, God and Nature do not work together in vain. Nothing quite says gothic style like wearing a bone in your ear. But what if you do not wish to go through the hassle of stretching your lobe? Well, you do not have to, as this Femur Bone Earring gives that look, without any added effort needed. Given their covetous and mystical nature, many dragons amass hordes of wealth and treasure. And this Dragon Orb Claw Earring is no different, in a fashion, depicting a traditional dragon claw as it clutches at a lovely and valuable looking sphere. Dragons are notorious for their love of treasure, and this one cannot help but flaunt the enormous crystal it has claimed! This Crystal Dragon Ear Wrap is an elegant way to bring a touch of fantasy to your attire, no matter what the occasion. The straight-forward design of these Heart's Blood Earringss belies their striking design. Vivid color makes them an eye-catching accent that when worn adds a splash of color to your look that few will be able to ignore, much less forget. What sound does a razor make? None, it is silent as the grave. The finesse and graceful lines of this Cut Throat Ear Wrap Earring belies its deadly potential, but have no fear, as it will only cut you a stunning new style when worn. What do you do with your other ear when you wear an accent like The Dragon's Lure Stud (item number 17-E274)? Why, you wear one of these Dragons Lure Head Stud Earrings of course, to perfectly complement the style of your gothic beastie! Gleaming with iridescent colors like the Northern Lights, these earrings share the beauty of the tears that fall to earth from the heavenly eyes of God. The Empyrian Eye: Tears From Heaven Earrings display intricate designs around the crystals. The Hi-Voltage Toric Generator Ring is an unusual, early, highly efficient power generator to augment the energy demands of Victorian hi-tech gadgets. 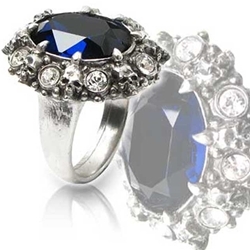 This gothic ring is made from fine English pewter with a 2-tone finish. The Rose Thorn Cross Earring features an alchemical cross of rose thorns surmounted by the skull of the master, creating a grim yet beautiful accent that is perfect for showing off a touch of gothic appeal in your look. The Pentagram Star Stud Earrings are miniature pentagrams for magical discretion. Pentagrams are a powerful symbols and talismans that possesses a myriad of different meaning in the mystical circles and gothic communities. The Parler Cuff Stud Earring has the style of the great 14th century cathedral architect. This bold design creates a distinctive accent that is perfect for adding a different sort of appeal to your look. Give your gothic style bat wings with these Martins Earrings. Bat like in their appearance, these unique accessories blend fluttering wings with decadent jewels to create an accent that any gothic girl or vampiress would want. Traces of human existence cling desperately to life. This Mortal Remains Earring Cuff is a cuff and stud style accent that brings a touch of classic gothic style to your ensemble by draping a skeletal hand and a skull from your ear. Pierced by the enduring symbol of sacrifice, Impalare Cross Earring piece the ear with a cross, creating a unique accent that is perfect not only for classic goths but also for those who prefer to carry their cross in a different way. The Omega Skull ring depicts the Alchemist skull, covered in his total, all powerful esoteric knowledge as a surface engraving over his grinning remains. This gothic skull ring is hand cast from fine English pewter. The In Memoriam Ring features a silent and sombre dedication expressed in this polished black-enamel, Victorian mourning ring. Our gothic rings are hand cast and made in England from fine English pewter. From the darkest depths of the sea does a tentacle rise to wrap your ear in an overwhelmingly powerful grip. Indeed, this Kraken Single Stud Earring creates a powerful statement that is sure to have an intriguing new effect on your sense of style! This Longbone Stud Earring looks quite like it could have come from an ossuary, as it is a discreet collection of bones that is all at once both elegant and disturbing. This earring is also versatile, serving well in a variety of looks. Usually when something is referred to as Ivy League, it is something elite, reserved for only the very best. If that is the case, these Ivy League Earrings qualify, as they are among the best of the best, as far as gothic style goes. Few symbols speak of love as easily as the heart, even in gothic style. The Love Blossoms Earrings are subtle yet lovely accent that eagerly tells of love, with a touch of natural design that is sure to impress all who see them. Stare deeply into the oblivion of long-passed mortal existence with the macabre faces depicted in these earrings. The Mortuarium Skull Earrings show off the grinning specters of these unfortunate souls. This colony of nocturnal bats silently invade the tranquility of the night, flying against the star-studded sky. The Night Sky Bats Ear Wrap features a series of black bats in mid-flight with crystals. The quintessential cogwheel, personifying the dynamic industrial and intellectual progress of the pre-eminent civilizations. This intricate accessory uses accouterments from the Victorian era as eye-catching decorations. Awesome single Magic Ram's Horn Earring is a faux expander features classic Gothic imagery including a rams horn which curls around the back of your ear. A great piece of jewellery for an alternative Gothic look! Many advocate living in the now and just leaving the future to be whatever may come. That mentality is reflected in these Live Now Stud Earrings, which depict a skull that is only concerned enjoying the present. Our Raven Ear Wing Earring Wrap is like a personal tutelary, ready to impart its supernatural intelligence to its master and invoking uncanny powers of protection, the black raven raffishly embraces the ear of its owner.